Much like James Bond villain Auric Goldfinger, Beverly Hills designer Hugh Power is the man with the Midas touch, literally. Power possesses a peculiar passion for turning everyday items into gold. Power has successful performed gilded transformations of mountain bikes, reading glasses, drinking straws, ear buds, shoelaces, guitar picks and much more. Power, who is the proprietor of the House of Solid Gold, earned a double dose of national exposure yesterday when the Huffington Post ran a feature story about his company under the category of “Weird News,” and then CNBC's “Secret Lives of the Super Rich” ran a segment on the designer and highlighted the fact that he crafted a gold toothpick for rapper Snoop Dogg. Most of Power’s items are designed in solid 18-karat gold. In some cases, 24-karat gold leaf, overlay or electroplate is used where practicality crosses everyday needs, according to the designer’s web site. Prices generally range from $800 to $495,000. Power considers his gilded products as objets d’art. Each signed piece is meticulously finished on the inside and out. Power claims to use only the finest quality gemstones and materials. 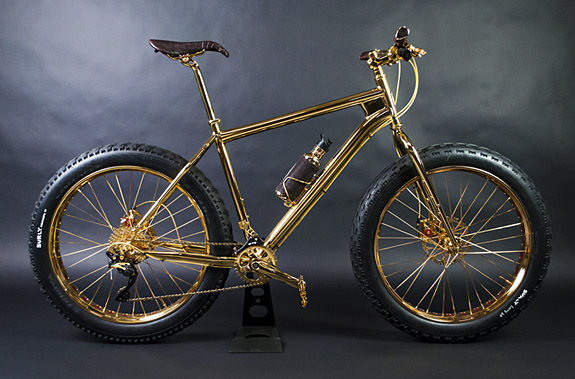 Power’s half-million-dollar extreme mountain bike, which took more than 750 hours to complete, is handcrafted and overlaid with pure 24-karat gold. The frame, chain, spokes and pedals are all covered in gold. The bike’s custom emblem bearing The House of Solid Gold logo ("THSG") is embellished with more than 600 black diamonds weighing 6 carats and 500 golden sapphires weighing 4.5 carats. The customized seat is covered in brown alligator skin and the water bottle is covered in gold and accented with chocolate brown stingray. 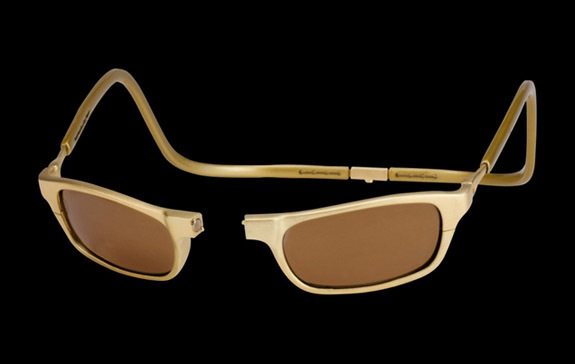 Merging elements of the luxury optical and fine jewelry industries, Power worked with inventor and patent holder Ron Lando to introduce a gilded version of CliC’s front magnetic connection eyewear. The frame, side stems and back piece are all fabricated in 18-karat solid gold. Power reported that it generally takes a master jeweler 50 hours to complete a pair of these limited-edition reading glasses. The price tag is $75,000. 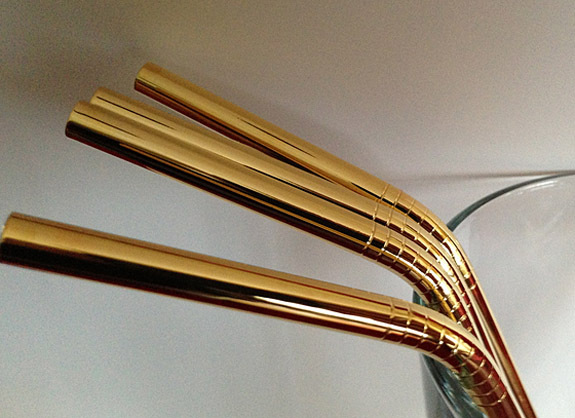 Priced at a relatively affordable $850, Power offers stainless steel drinking straws that are overlaid, inside and out, with pure 24-karat gold. The straws are not only for show, but can be used to sip one’s favorite beverage. 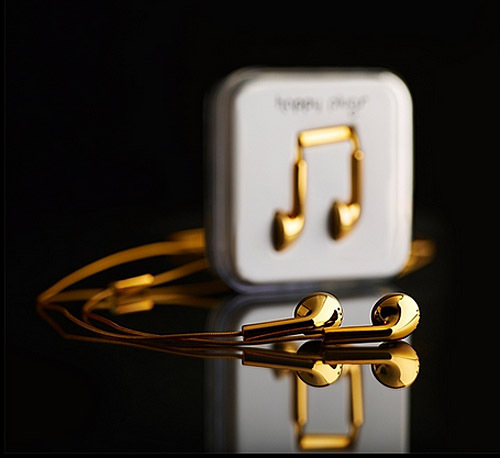 Another common item transformed into fine jewelry is a pair of earbuds crafted in 18-karat solid gold. Every pair is produced by hand in Stockholm, Sweden, by Happy Plugs CEO and founder Andreas Vural and his master jeweler. Each earbud weighs 25 grams, or 50 grams for the pair. The price is $14,995. 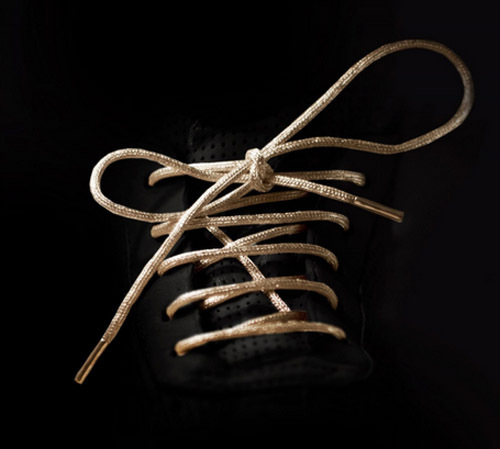 For the sporty consumer looking for a little extra bling, Power presents 24-karat gold shoelaces for $14,995. The laces are woven from 24-karat gold thread. Using ancient artisan techniques, "the world's most expensive shoelaces" are manufactured in the Cauca gold belt less than 10 miles from where the gold was mined in Columbia. Each pair takes 120 hours to create. 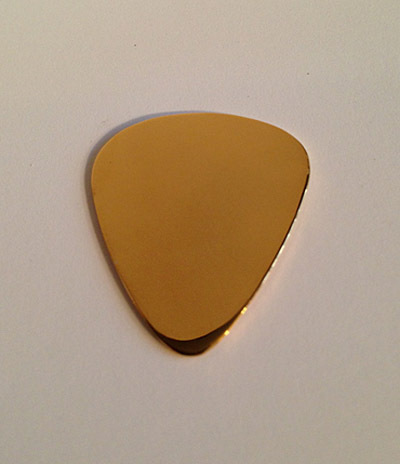 Power’s simplest offering is an 18-karat solid gold guitar pick. The item has a standard size and thickness and is hand polished to a high luster. The maker claims that the sound produced with a solid gold guitar pick has a mellow brightness. The pick also may be used as a makeshift slide. The price is $1,498. 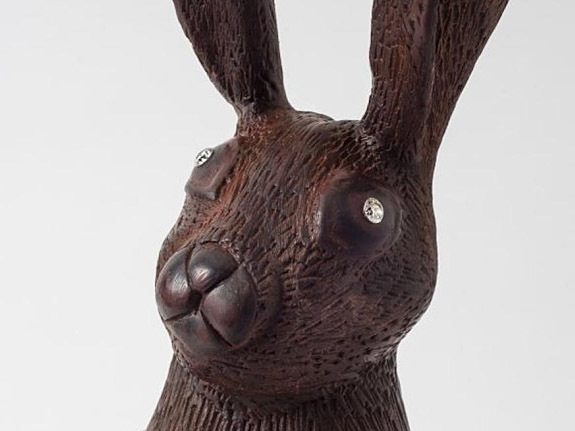 With Easter arriving this Sunday, we thought it would be fun to take a close look at the world’s most extravagant chocolate Easter bunny — a confectionery masterpiece that boasts real diamonds for eyes and a price tag of $49,000. 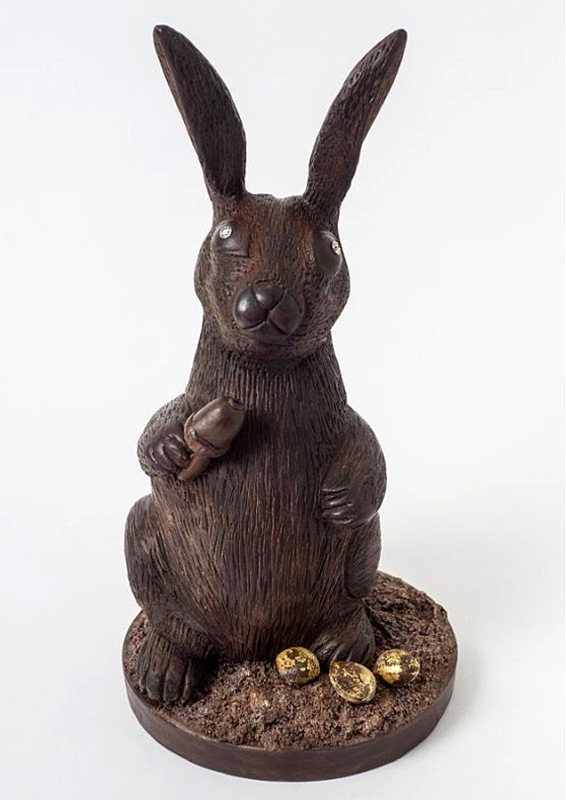 British master chocolatier Martin Chiffers spares no expense in the execution of the 15-inch-tall statuette that he personally hand carves from a solid block of Tanzania-sourced chocolate. The bunny weighs in at a dense 11 pounds and packs a staggering 548,000 calories. But even more impressive are the bunny’s ravishing diamond eyes — each a GIA-certified round brilliant-cut gem that weighs 1.7 carats. Nestled around the bunny's left foot is a gilded bonus — three edible gold-leaf Easter eggs that punctuate the lavish design. Although Chiffers frequently finds himself pushing the limits of chocolate indulgence, this is the first time he’s used gems in his creations. 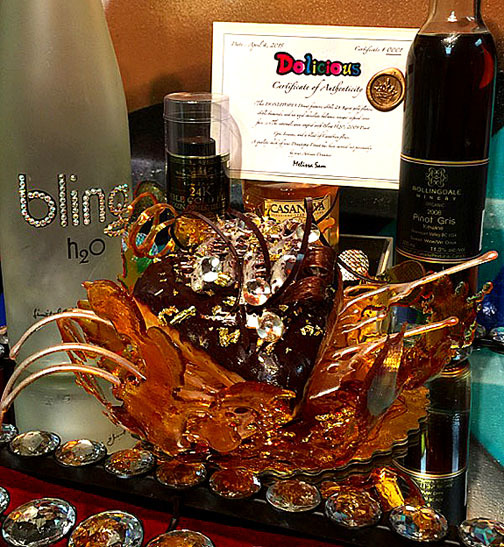 “While I'm am very accustomed to teaching about and creating extravagant luxury chocolate pieces,” he said, “incorporating diamonds is a first." The VS clarity, G-color diamonds are valued at $37,320, or about 76% of the bunny’s total value. The rest is attributed to the high-end chocolate and the amount of labor that goes into the piece. Chiffers reported that the carving of the chocolate takes two full days. On his Facebook page, he called the process "therapeutic." For this diamond bunny project, Chiffers collaborated with two London-based firms famous for their over-the-top offerings — the web site VeryFirstTo and online jeweler 77 Diamonds. While the original bunny design calls for white diamond eyes, Chiffers is able to swap them out for colored diamonds or other precious gemstones. Once the bunny is devoured, 77 Diamonds is offering to set the gemstone eyes into a custom piece of jewelry at no extra charge. Eleven pounds of chocolate may take a while to consume, but the good news is that the bunny has a two-year shelf life if it is kept at the relatively cool temperature of 60 degrees Fahrenheit. Welcome to Music Friday when we feature fabulous songs with jewelry, gemstones or precious metals in the lyrics or title. 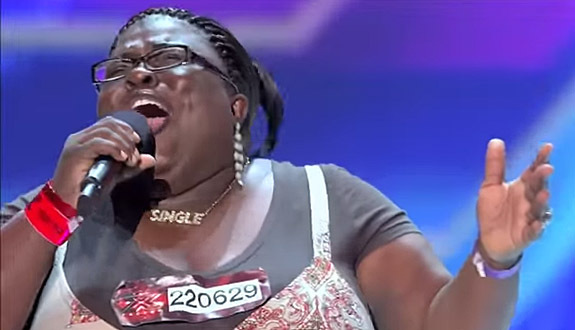 Today we shine the spotlight on X Factor contestant Panda Ross singing Sam Cooke’s “Bring It on Home to Me” during the talent competition’s 2012 auditions. Ross’ vivacious personality, fabulous voice and unabashed crush on X Factor judge Simon Cowell made her appearance a memorable one. 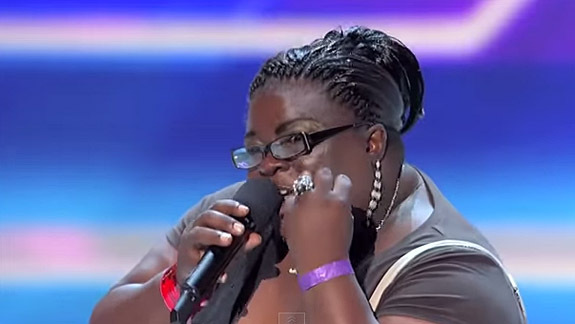 Her audition, which included two light-hearted jewelry references, was seen by a TV audience of eight million. The viral video of her performance attracted 12 million views on YouTube. Ross’ wild ride to the national stage was hardly a smooth one. Born in a Huntsville, Texas, prison and raised by her grandmother in Hobbs, N.M., Ross’ troubled youth was colored by drug use and poor decisions. She served prison time and was “so near death so many times,” she said. When she found her faith, her life turned around. Since appearing on the show 2½ years ago, Ross has lost more than 100 pounds, has furthered her vocal training and has sung in churches and other venues all over the U.S. Written by Sam Cooke. Performed by Panda Ross. Last May, the auctioneers at Woolley and Wallis were astonished when a single 17.4mm natural pearl sold for $1.37 million, nearly seven times its pre-sale estimate. On April 14, Christie’s New York will be presenting an exceptionally rare four-strand necklace featuring 289 natural pearls. The auction house estimated the selling price to range from $3.8 million to $4.5 million, a bargain by comparison. The natural saltwater pearls in the necklace range in size from 4.9mm to 12.65mm and vary in color from natural grey to brown, with attractive rosé, green or purple overtones and very fine iridescence. The four nested strands have 81, 76, 69 and 63 pearls, respectively. The colorful pearl necklace featured at Christie’s Magnificent Jewels sale is an extremely unusual offering. 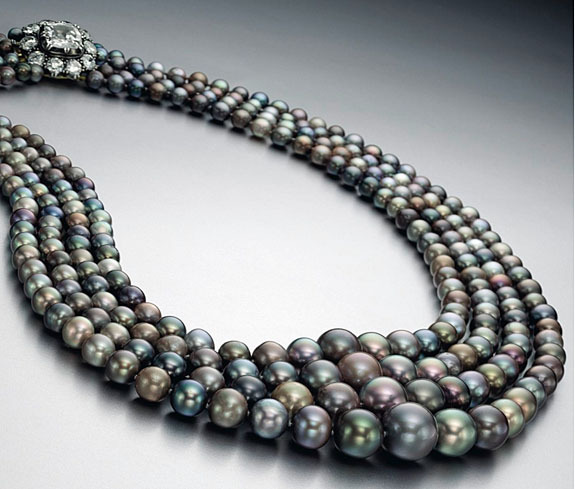 The auction house could cite only two similar lots over the past 50 years — The Nina Dyer Black Pearl Necklace, sold at Christie’s Geneva in May 1969, and more recently, The Cowdray Pearls sold at Christie’s London in June 2012. Natural pearls are some of the most coveted of all gemstones because of their rarity. Natural pearls are organic, created by a mollusk totally by chance and without human intervention. Cultured pearls, on the other hand, are grown under controlled conditions, where a bead is implanted in the body of the mollusk to stimulate the secretion of nacre. • Fancy intense purplish-pink diamond ring. This platinum ring is set with a cut-cornered rectangular-cut fancy intense purplish-pink diamond weighing approximately 5.29 carats and flanked on either side by half moon-cut diamonds. 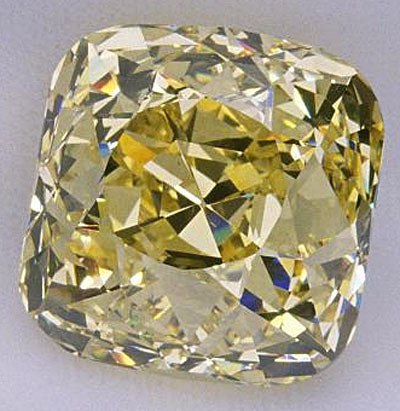 The natural colored diamond has a VS2 clarity. Diamonds of this color and clarity constitute less than 0.1% of all naturally occurring diamonds. 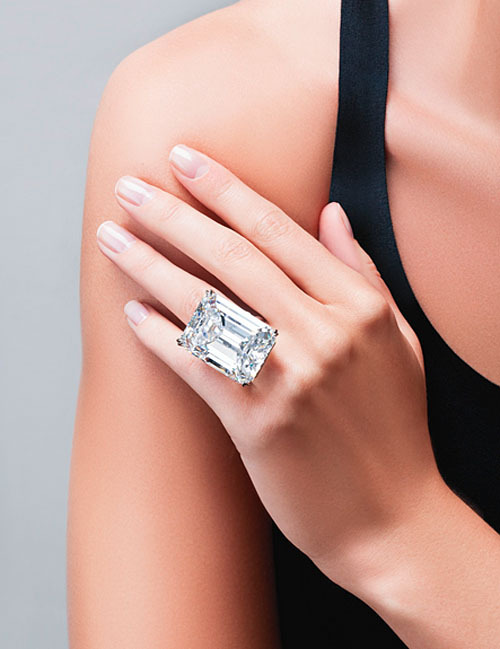 The ring carries an estimated price of $3.5 million to $5 million. 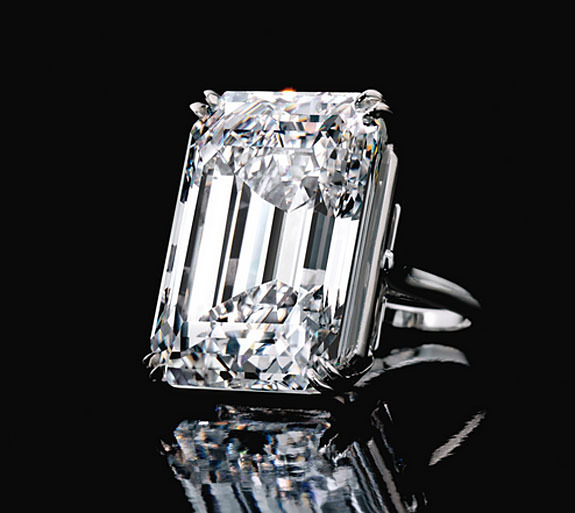 • Cushion-cut diamond ring of 80.73 carats. Also expected to yield up to $5 million is this impressive diamond ring, featuring a K-color, VS2 clarity diamond with excellent polish and symmetry. The diamond is set in platinum. • Millicent Rogers ruby heart brooch by Paul Flato. As the original “Jeweler to the Stars” back in the 1930s, Flato designed whimsical pieces that reflected his great sense of humor. The puffy ruby heart brooch, above, was designed for the Standard Oil heiress, a woman of high fashion who was routinely on the International Best Dressed list. 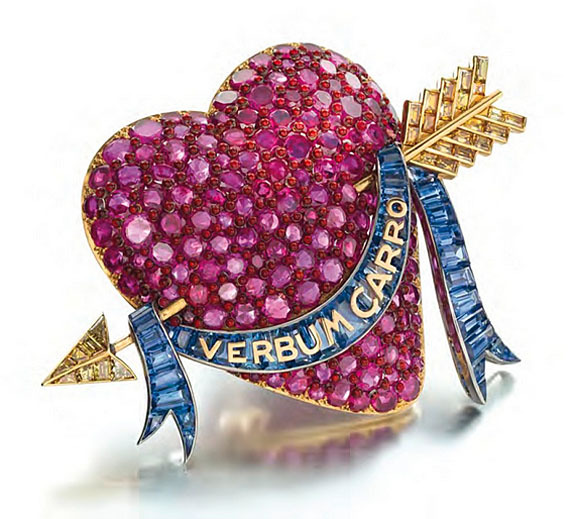 Flato used rubies, sapphires and colored diamonds in a design featuring a heart pierced by an 18-karat gold arrow and draped with a blue ribbon with the words “Verbum Carro” (“A word to my dear one”). The brooch has a pre-sale estimate of $350,000 to $500,000. To honor the opening of the Major League Baseball season, we present you with one of the most infamous “jewelry” stories in MLB’s history. 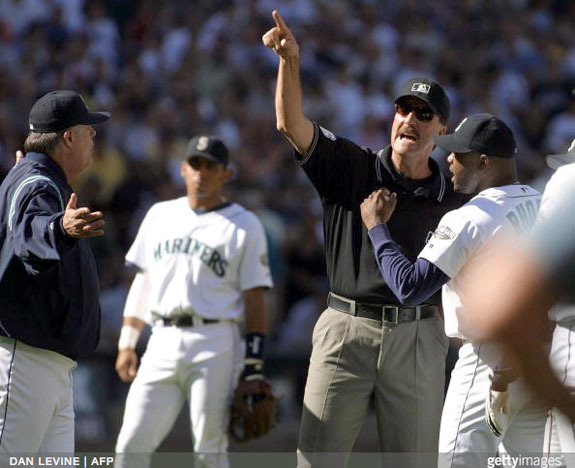 It’s the now-legendary tale of how a pair of diamond stud earrings nearly ignited a bench-clearing brawl between the Seattle Mariners and the Cleveland Indians. The date was August 25, 2001, and the sun was low in the sky at a sold-out Safeco Field in Seattle. The score was tied at 2-2 in the top of the ninth, and the Mariners’ fire-balling relief pitcher Arthur Rhodes was summoned from the bullpen to face the Indians’ shortstop Omar Vizquel. As the burly relief pitcher warmed up his 96 mph heater, the diminutive batter complained to plate umpire Ed Rapuano that he was being distracted by the sun reflecting off the pitcher's diamond stud earrings. When Rapuano approached the pitcher’s mound and ordered Rhodes to remove his earrings, the pitcher became enraged. "I told the umpire I've been wearing them the whole year," he said. "So why should I take them out?" Rhodes argued with Rapuano and refused to back down. Rhodes then turned his anger on the batter, pointing at Vizquel and calling him out. Then, predictably, the two teams poured out of their dugouts and onto the field. The pitcher agreed to remove one earring, but then the drama spun wildly out of control when Rhodes intimated by pointed at Vizquel’s head that the next pitch would have him bailing from the plate. Third-base umpire Tim McClelland ejected Rhodes from the game before he could throw a single pitch. "It became a shouting match between Vizquel and Rhodes," said McClelland. "To stop anything further, I asked Arthur to leave." The banished Rhodes tried to go after Vizquel, but was restrained by manager Lou Piniella. 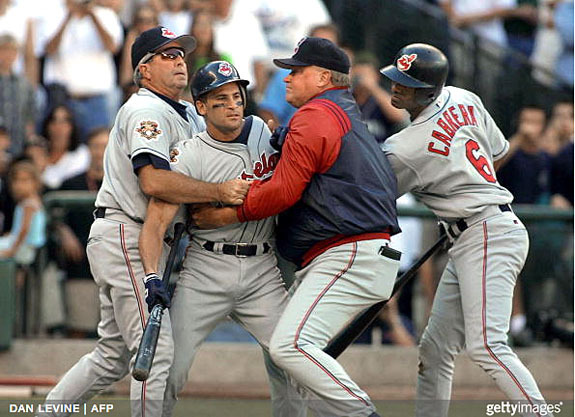 Vizquel had to be held back, as well. "I'm not going to let a guy who weighs 125 pounds tell me to take my earring out," Rhodes said. Despite the incident, Rhodes never abandoned his ear bling. 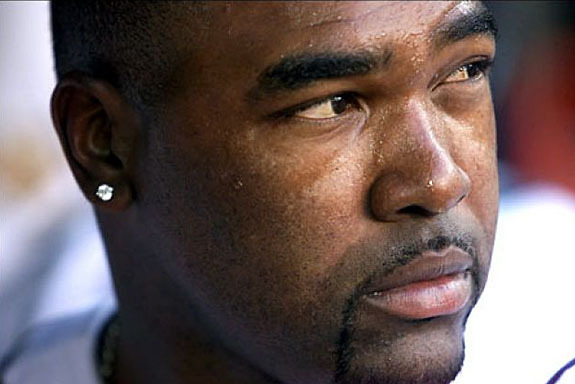 He continued to wear the earring studs throughout his career, which spanned 20 years and nine major league teams. 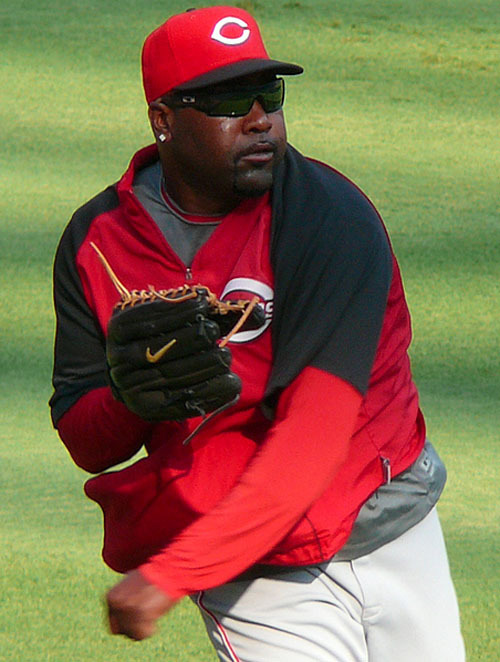 His diamond earrings are in clear sight in this 2009 shot when he was playing for the Cincinnati Reds. MLB seems to maintain an unwritten policy, however, that jewelry on a pitcher is OK — unless the batter makes a specific complaint. Credits: Dan DeLong/Seattle Post-Intelligencer; Getty Images; Chris J. Nelson via Wikimedia Commons. Shimmering with 146 pavé diamonds set in white gold, the 2014 American League championship rings commemorate the Kansas City Royals’ flawless 8-0 postseason run to the World Series. 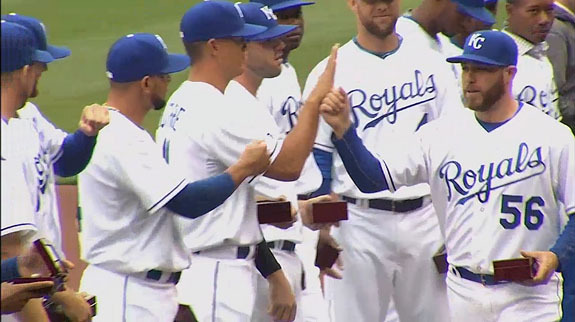 Team members accepted their rings during Monday’s home opener at Kaufman Stadium, also known as “The K.” Perhaps energized by its impressive new bling, the team went on to crush the Chicago White Sox by a score of 10-1. Although the Royals were picked as slight favorites going into 2014's Fall Classic, the San Francisco Giants prevailed in seven games. 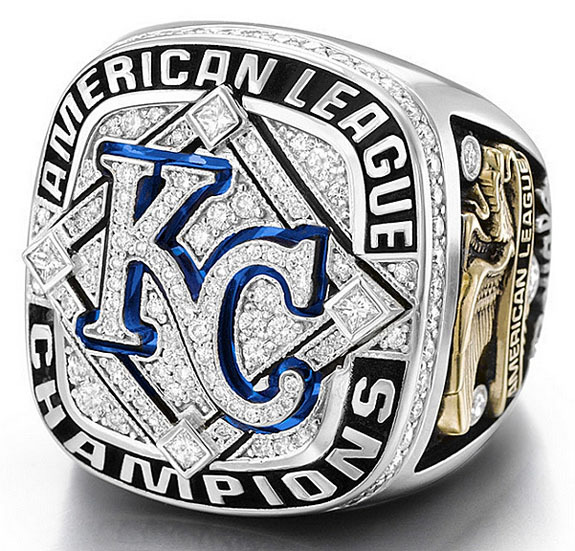 Designed by Jostens, the rings feature the distinctive “KC” logo formed from 34 pavé diamonds outlined by a custom — but unidentified — stone especially color matched to the iconic Kansas City Royals’ official blue. The “KC” logo sits above a stylized baseball diamond that is literally made of diamonds. Each “base” is a princess-cut diamond. The diamond total weight of the ring is 1.9 carats. The metal is 10-karat gold. The perimeter of the front of the ring says “American League Champions” in raised white gold lettering on a back enamel background. The shoulder of the ring is completely encircled with round pavé diamonds. Three larger bezel-set round diamonds — representing the team’s three American League pennants — embellish the right side of the ring. 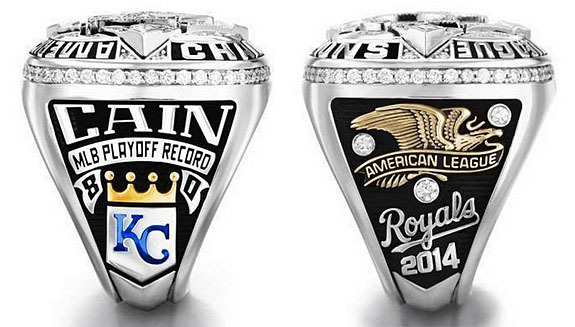 Also featured are the American League eagle logo in yellow gold, the name “Royals” in script and the year 2014. The rings were delivered to the stadium by armored car and presented to players, coaches and staff during the pre-game ceremonies. The team also raised an American League 2014 Championship flag in centerfield. “Every team’s goal is to celebrate its on-field accomplishments,” said Royals president Dan Glass, “and it is with tremendous pride that we present this custom ring symbolic of the effort that went into winning the 2014 American League pennant. The team’s eight-win playoff streak included a Wild Card victory over the Oakland Atletics, a Division Series sweep of the Los Angeles Angels of Anaheim and the AL Championship Series romp over the Baltimore Orioles. 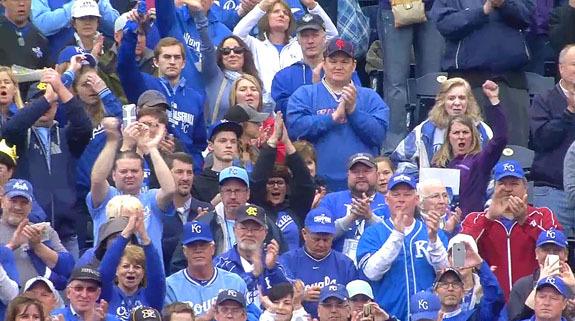 The Royals beat the Giants in Games 2, 3 and 6 of the World Series, but lost a 3-2 heartbreaker in Game 7. The Giants will collect their World Series rings on April 18. Credits: Screen captures via Foxsports.com; Rings by Jostens, Inc.
To celebrate April’s official birthstone, let's revisit what was billed as a once-in-a-lifetime opportunity to see the Magnificent Seven side by side. The star-studded lineup included the 203.04-carat De Beers Millennium Star (colorless), 101.29-carat Allnatt (yellow), 59.60-carat Pink Star (formerly the Steinmetz Pink), 27.64-carat Heart of Eternity (blue), 5.54-carat Pumpkin Diamond (orange), 5.51-carat Ocean Dream (blue-green) and the 5.11-carat Moussaieff Red. Millennium Star. 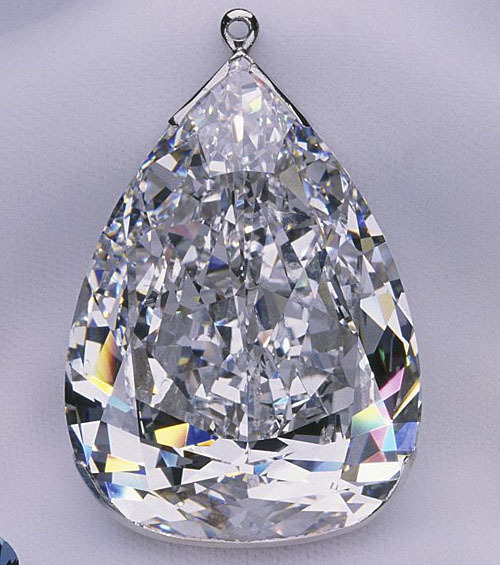 Insured for $148 million, this D-color marvel is the world’s second-largest internally flawless pear-shaped diamond. Uncut, it was 777 carats. 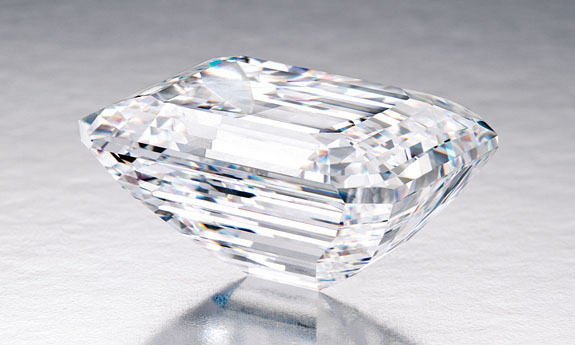 Using lasers, the Steinmetz Diamond Group took three years to perfect its final form. The diamond was introduced to the world in October 1999 as the centerpiece of the De Beers Millennium collection. Allnatt. Rated fancy vivid yellow, the diamond’s brilliant color is the result of a chemical impurity, where trace nitrogen atoms replaced some of the crystal’s carbon atoms. The gem is named after its former British owner, Major Alfred Ernest Allnatt. The estimated value of the stone is at least $3 million. Pink Star. This internally flawless gem is the largest known diamond to have been rated fancy vivid pink. Its value is $83.2 million. The Steinmetz Group took more than 20 months to cut the stone that is considered a mixed oval brilliant because it has a step-cut crown and brilliant-cut pavilion. Heart of Eternity. 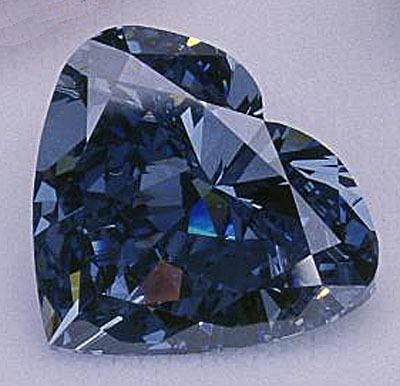 Rated fancy vivid blue and valued at $16 million, this heart-shaped diamond gets its unique color from the presence of boron atoms trapped in the crystal structure. 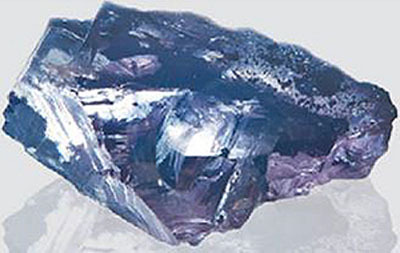 Blue diamonds account for less than 0.1% of the output of the Premier Diamond Mine in South Africa, the only place in the world with an appreciable production of blue diamonds. The Pumpkin Diamond. This fancy vivid orange diamond was called the 5.54 Vivid Orange, but was renamed the Pumpkin Diamond by Harry Winston Inc.’s Ronald Winston, who purchased it on the day before Halloween in 1998. Valued at $3 million, the orange diamond was worn in a ring by film actress Halle Berry in 2002 when she received an Oscar for her role in Monster’s Ball. The Ocean Dream. Known for its unusual fancy deep blue-green hue, this trillion-cut gem is one of the rarest diamonds in the world. The Gemological Institute of America concluded that the natural hue is the result of millions of years of exposure to the Earth’s natural radiation. The Moussaieff Red. 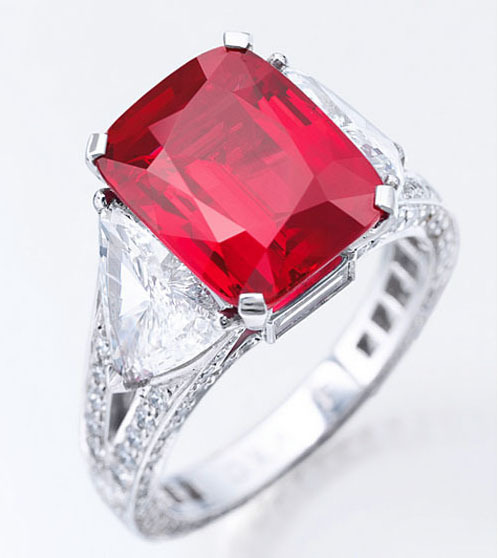 Rated fancy red by the GIA, this trillion-cut stone is the world’s largest red diamond. Cut and polished from a 13.9-carat crystal discovered in the 1990s by a Brazilian farmer, the diamond was originally called The Red Shield Diamond. It was renamed when Moussaieff Jewellers purchased the stone in 2002. It has an estimated value of $20 million. In the song she co-wrote with producer Starsmith, she encourages her boyfriend to take chances, be independent-minded and try new things. When he’s ready to settle down, she’ll be waiting for him because he’s a risk she’ll always take. She sings, “We'll watch the buildings turn to dust / A sky of diamonds just for us.” The diamonds symbolized their idyllic life together. 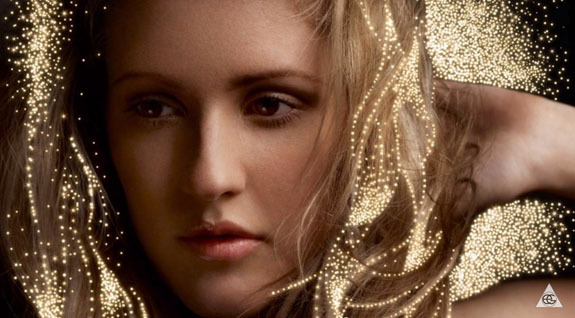 “I’ll Hold My Breath” became the ninth track on Goulding’s wildly successful debut album called Lights. Released in February of 2010, Lights entered the UK Albums Chart at #1 and climbed to a respectable #21 on the U.S. Billboard 200 chart. Her current hit "Love Me Like You Do [From Fifty Shades of Grey]" is #3 on the U.S. Billboard Hot 100 list. Born in Herefordshire, England, the musically gifted Goulding played the clarinet at the age of nine and the guitar at 14. She began writing songs at the age of 15. Goulding, who boasts a vocal range of three octaves, got her big break when she met producer Fin Dow-Smith through Myspace while she was studying drama at the University of Kent. By the fall of 2009, she had released her first single, and a year later she was picked as “the artist to watch” when she emerged at the top of the BBC Sound of 2010 poll. In 2011, Goulding made headlines when she was selected to perform at the wedding of Prince William and Kate Middleton. Written by Ellie Goulding and Fin Dow-Smith. Performed by Ellie Goulding. Reassure me that you'll wait for me, wait for me as long as it takes! 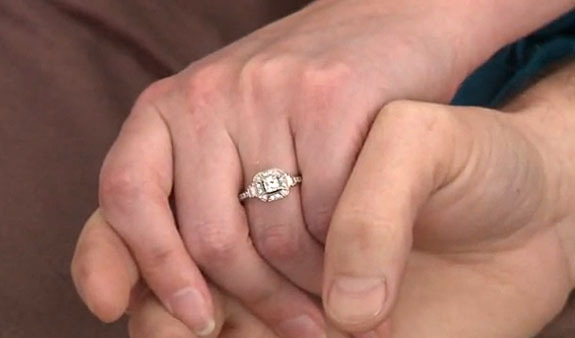 Stating that she didn’t want her diamond engagement ring to become another pawn shop ring because, for her, it was a “symbol of love and happiness,” a New Mexico woman decided to gift it to a deserving couple. 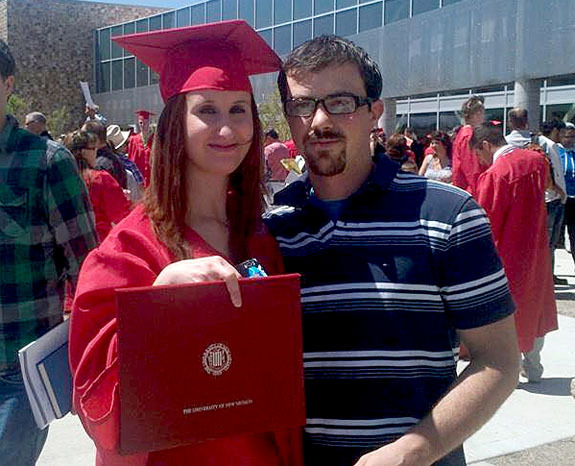 With the assistance of the Albuquerque Community Facebook page called “Inhabitants of Burque,” the anonymous benefactor, whose own relationship just didn’t work out, found the perfect match within 24 hours of posting her offer on Monday, April 6. Josh Michaels and Laura Aitken have been engaged since 2013, the same year Michaels was diagnosed with rare form of stage-four cancer. 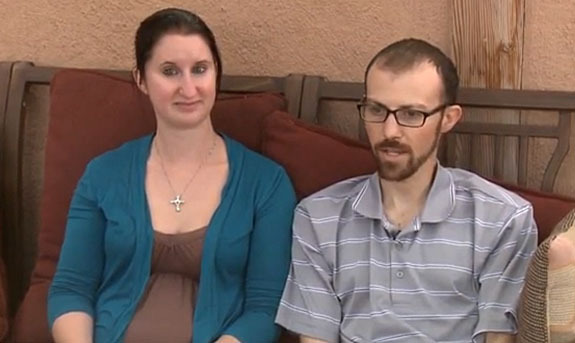 For the past two years, the couple has battled through 18 cycles of chemotherapy, three surgeries and a crushing amount of medical-related debt. Michaels is currently on disability and they are struggling to keep their home. “I’ve been told a few different things you know, ‘I wasn’t gonna make it, I had two months left,’ and I’m still here,” Michaels told KRQE News 13. “To break up and to give up would have been worse to me than for him to pass away,” added Aitken. Making the ring presentation to Michaels and Aitken was Leo York of the Inhabitants of Burque Facebook page. “It’s just little things like this that keep you strong, keep you going,” said Michaels. At the end of the presentation, with the media gone, Michaels and Aiken finally got to meet their benefactor, who secretly had been waiting in the wings. She exchanged hugs with the couple and confirmed that the ring was full of “positive vibes” even though her own relationship didn’t work out. Images: Screen captures via KRQE.com; Facebook/Inhabitants of Burque. 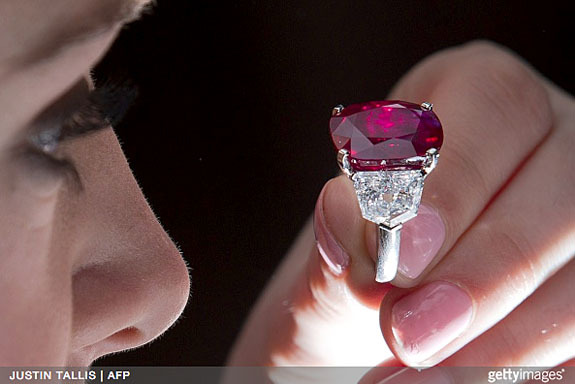 The 25.59-carat, pigeon-blood-red “Sunrise Ruby” is expected to crush an auction record for the highest price ever paid for a ruby when it fetches between $12 million and $18 million at Sotheby’s Magnificent Jewels and Noble Jewels sale in Geneva next month. The hammer price on The Sunrise Ruby should easily eclipse Laurence Graff's $8.6 million winning bid last November for the current record holder — the Graff Ruby. Sotheby’s described The Sunrise Ruby — Lot 502 of the May 12 sale — as a superb and extremely rare ruby and diamond ring by Cartier. The cushion-shaped ruby is set between two shield-shaped white diamonds weighing 2.47 carats and 2.70 carats, respectively. 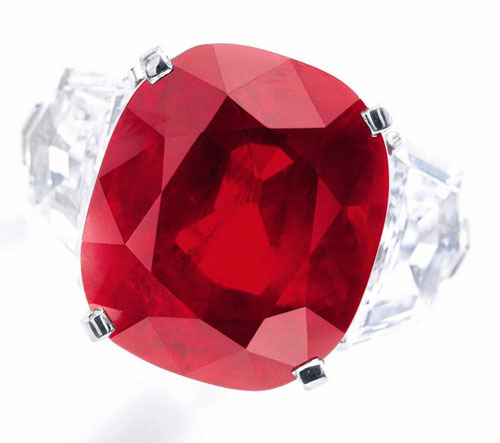 A grading report by Gübelin states that the ruby is of Burmese origin and exhibits a well proportioned cutting style. • “Ivresse” Diamond Necklace. 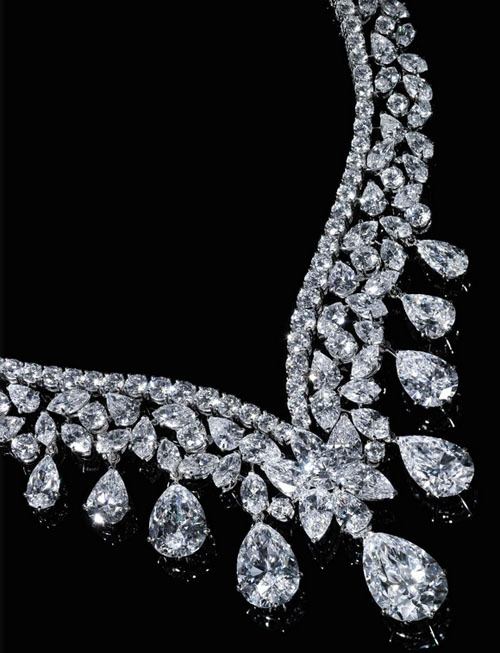 Cascading with round, pear-shaped and marquise-shaped diamonds, this extraordinary necklace by Cartier has a total weight of 190.77 carats and an estimated price of $6 million to $10 million. 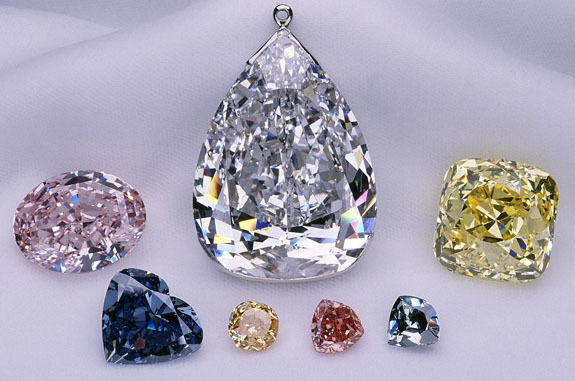 The three largest diamonds in the piece — 10.25, 12.04 and 20.38 carats — all are D in color. 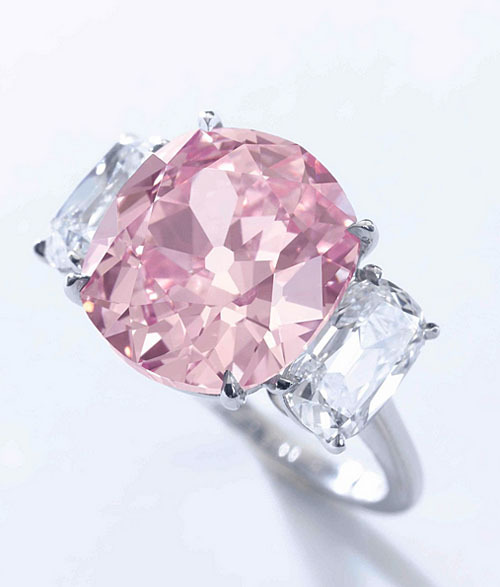 • The Historic Pink Diamond. 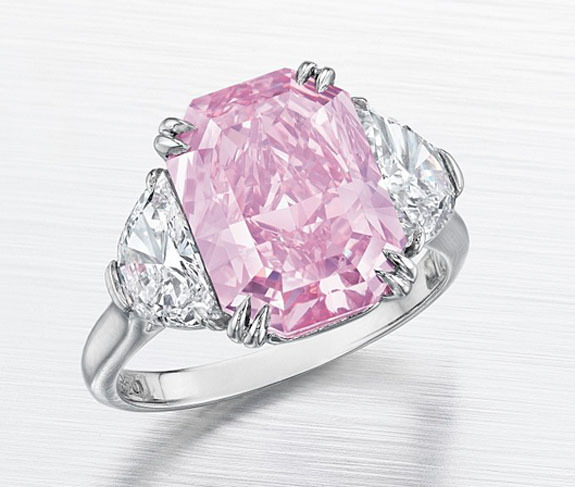 A fancy vivid pink diamond weighing 8.72 carats is the focal point of this ring accented with two cushion-cut white diamonds, each weighing a little over a carat. The center diamond was once the property of heiress and philanthropist Huguette Clark and weighed 9 carats before it was repolished. The ring has an estimated price range of $14 million to $18 million. 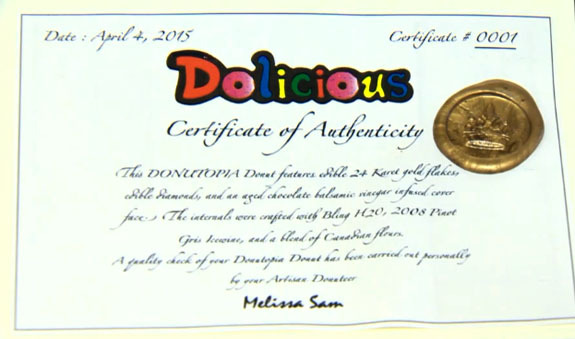 Decadently decorated with 24-karat edible gold and faceted sugar “diamonds,” the blinged-out “Donutopia” donut comes with a Certificate of Authenticity and would feel very much at home in a jeweler’s showcase. The over-the-top donut, which nests in a sugar bowl and costs $100, is made with aged chocolate balsamic vinegar and infused with ice wine. In making the batter, ordinary water is replaced with Bling H20, a luxury bottled water with a starting price of $29 per 200ml bottle. The donut is also loaded with some other treats, but a spokesperson for Dolicious Donuts, which unveiled the spectacular sweet snack to celebrate its new location in West Kelowna, British Columbia, said he couldn’t divulge what they were. “Otherwise, I think the baker might shoot me,” he joked. The husband-and-wife team of Torsten and Jeanne Kaminski told The Vancouver Sun that Donutopia was conceived when a regular customer wanted a special donut to be at the center of his marriage proposal. The suitor’s plan was to hide the engagement ring in the donut and then, once his girlfriend discovered it, he would propose right there in the bakery. “It was such a happy thing that we came up with the Donutopia,” said Jeanne Kaminski. “Each one takes three to five hours to make. 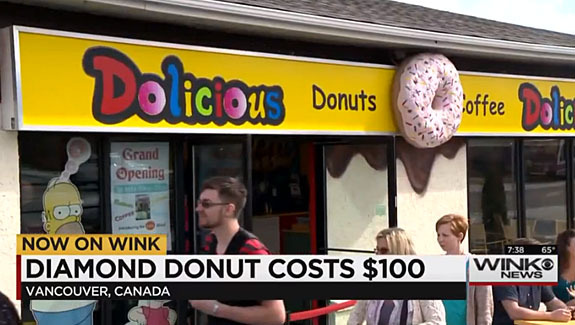 The value of the donut is more than $100,” Kaminski told The Vancouver Sun. Media outlets were quick to pounce on the novel story. A local TV news host seemed to be impressed by the donut, but wondered aloud how diamonds could be edible. He didn’t realize the “diamonds” were actually candy. The Donutopia aligns neatly with the owners’ strategy to create a unique experience for their customers. "Inside [the store] is completely wild and crazy, a place to escape reality," Kaminski told castanet.net. 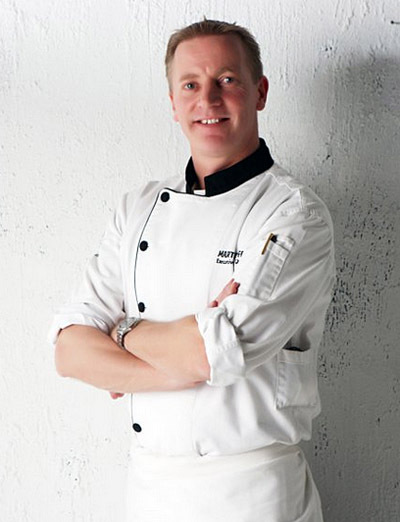 Kaminski has earmarked all proceeds from the sales of the Donutopia to help establish a soup kitchen in West Kelowna. Top image via dolicious.ca. Screen captures via globalnews.ca and winknews.com. 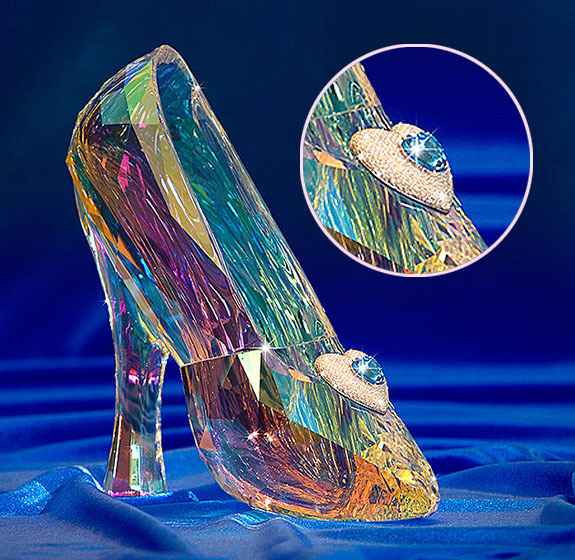 A crystal Cinderella slipper adorned with a diamond-and-topaz pendant is one of the top prizes in the Diamond Days Sweepstakes celebrating Disneyland’s 60th anniversary. The removable heart-shaped pendant is affixed to the front of the shoe and glistens with pavé diamonds centered by a large heart-shaped blue topaz. Beginning May 22, Disney also will be giving away weekly prizes that include one- and two-carat genuine diamonds laser engraved especially for Disney. 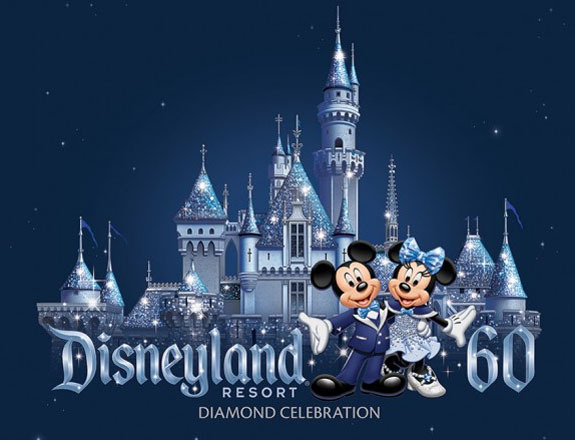 Some Disney Diamonds will commemorate dates with particular significance to the “Happiest Place on Earth.” The one-carat Disney Diamonds will be paired with a stay in the Disneyland Dream Suite. 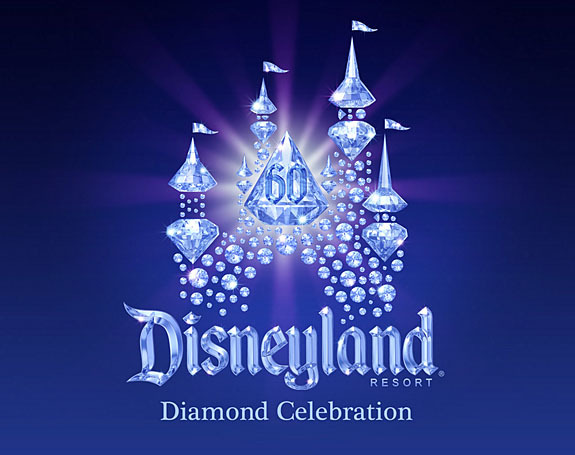 Diamonds dominate the park’s 60th anniversary branding. For instance, two graphics from the Disney web site show the iconic Cinderella castle rendered in glistening diamonds. Some non-jewelry prizes include a private party in Fantasyland, a romantic cruise aboard the Mark Twain Riverboat and a tailgate party in Cars Land. The Disneyland Resort Diamond Celebration will also include daily prizes, such as individualized tours of the parks, preferred viewing for evening entertainment experiences and priority access to selected attractions. According to Disney Resorts’ official blog, the top prizes will vary weekly. The company did not announce when the promotion will end. Musical groups at the park will be incorporating "diamond" moments in their shows, from Diamond Sing-Alongs with the Dapper Dans to Diamond Dance-Alongs with the Straw Hatters. The diamond anniversary festivities will kick off with a 24-hour party, from 6 a.m. Friday, May 22, to 6 a.m. Saturday, May 23, 2015. Officially opened in Anaheim, Calif., on July 17, 1955, under the direct supervision of Walt Disney, Disneyland is one of the world’s most famous destinations with more than 16 million visitors annually and 650 million since its inception. No purchase is necessary to participate in the sweepstakes. Official rules will be posted at Disneyland.com/DiamondDays on May 22, 2015. Nicki Minaj had Instagram fans buzzing last week after posting a photo of herself with fellow rapper Meek Mill in front of a luxury sports car in Miami. 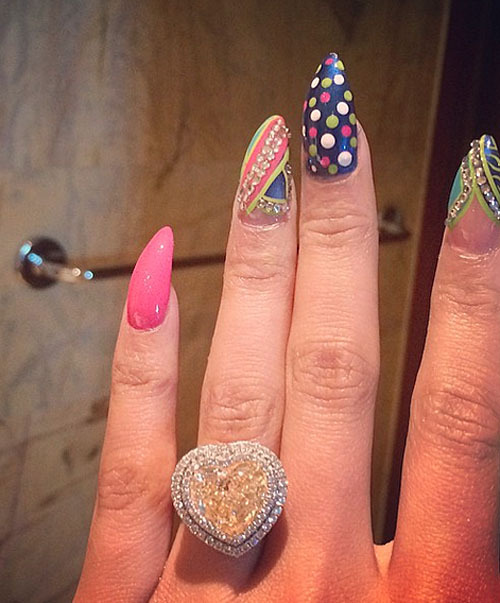 Minaj then teased fans on Twitter, coyly posting emojis of a diamond ring, a yellow heart, and plain diamonds with the line, “I’ll post it later.” Later, she shared the bling – a spectacular yellow heart-shaped diamond ring on her left ring finger, sparking rumors that she and Mill are engaged. Pascal Mouawad, of Los Angeles’ Mouawad Jewelers, tells Page Six the retail value of the ring could be as much as $500,000. “It is most likely a custom ring made especially for her,” he added, also speculating there could be more than 100 total diamonds in the ring. "This looks like a 15-carat fancy yellow heart modified brilliant cut diamond mounted in platinum with a double halo of white pavé diamonds," said jewelry expert Morgan Shara of MASbisjoux jewelry. Shara told E! 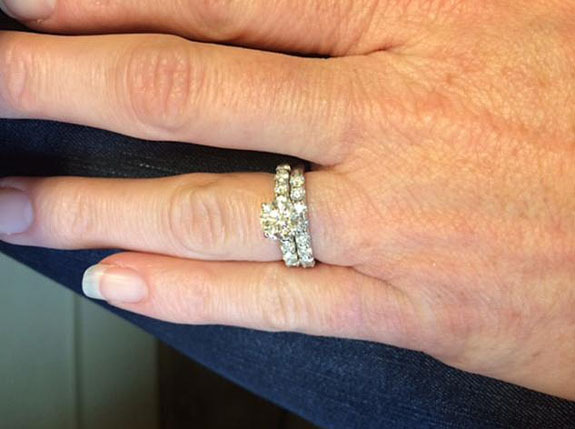 News, "This would retail for approximately $500,000.” Shara added that the ring "looks like the natural fancy colored diamond trend that is continuing full steam ahead." 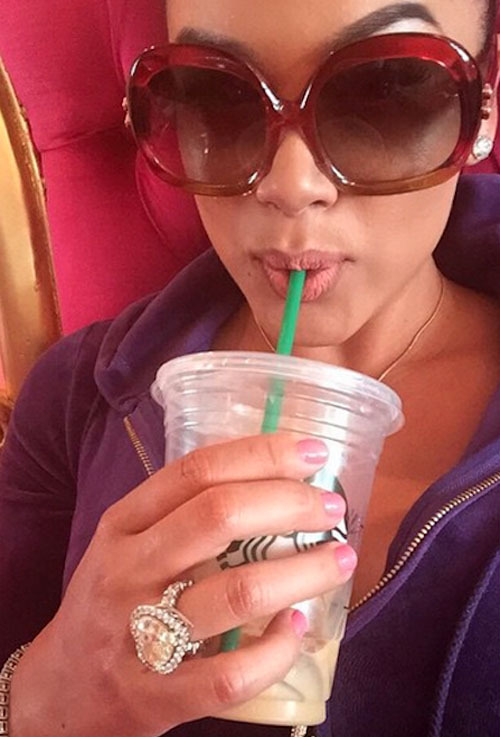 According to Hip Hop DX, after photos of Nicki Minaj’s ring were posted, pro boxer Floyd Mayweather’s girlfriend, Bad Medina, posted a picture of a similar ring — inciting a snarky response from Mill. The 32-year-old multi-platinum superstar rapper/singer of “Super Bass,” “Starships” and “Anaconda” fame has transcended genres, consistently commanding at the top spot of numerous music charts, including Hip-Hop, R&B, Pop, and Dance/Mix. Her third studio album, The Pinkprint, was released on Dec. 15. 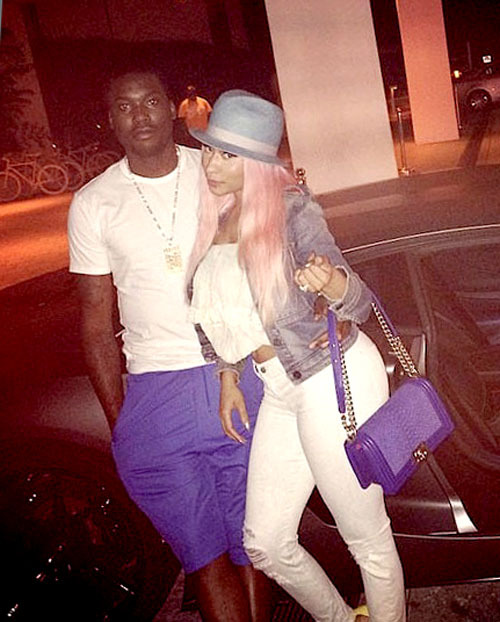 Minaj and Mill, 27, had been spotted around town in recent months holding hands. In January, Page Six reported spotting the couple dining at the trendy Red Stixs in Manhattan. Minaj insisted, however, that the friendship was strictly platonic. 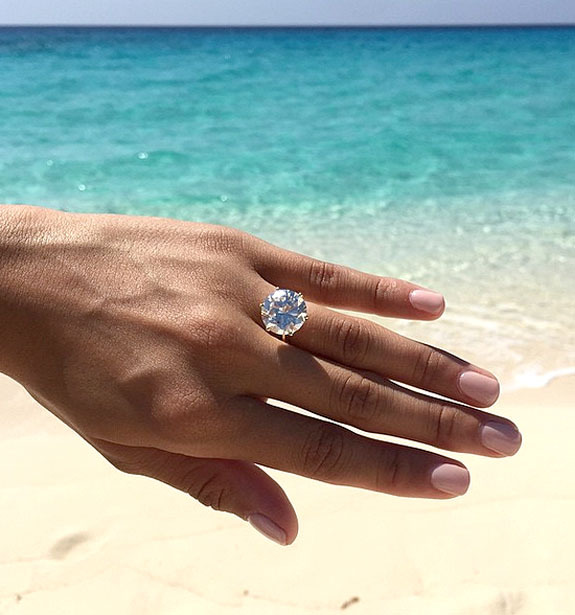 We’ve reported here on many big, bold and beautiful celebrity engagement rings. 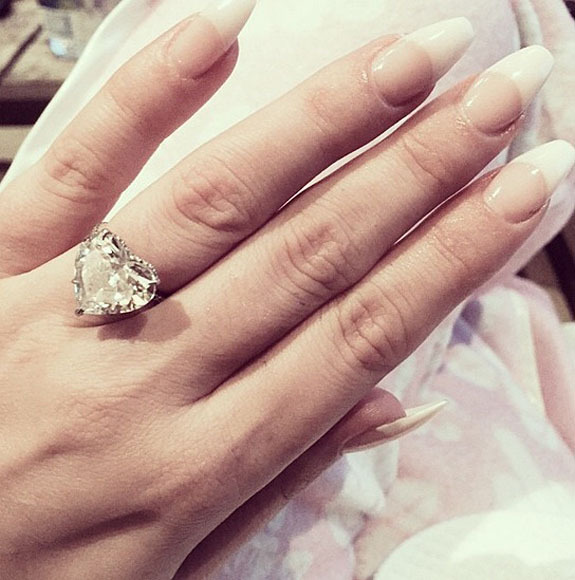 Back in February, Lady Gaga accepted a dazzling heart-shaped engagement ring on Valentine’s Day. The ring was designed by Lorraine Schwartz and features the letters T and S separated by a heart symbol on the band to represent Taylor loves Stefani (Lady Gaga's real name). The ring’s value was estimated to be $500K. While neither Minaj nor Mill has confirmed their engagement, a source told E! News the pair were definitely getting married and that Minaj's supersize bling cost $500,000. Minaj broke up with Safaree Samuels in 2014. 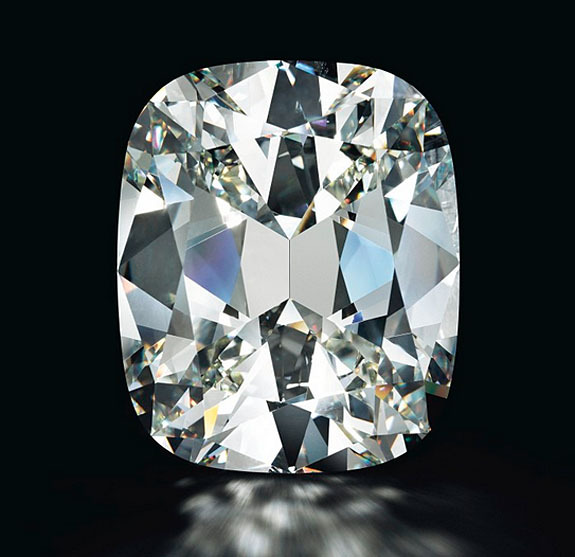 A 100.20-carat D-flawless diamond — one of only six 100-carat-plus “perfect” diamonds to hit the auction block in the past 25 years — fetched $22.1 million at Sotheby’s Magnificent Jewels event in New York yesterday. The final price was halfway between the auction house’s $19 million to $25 million pre-sale estimate. 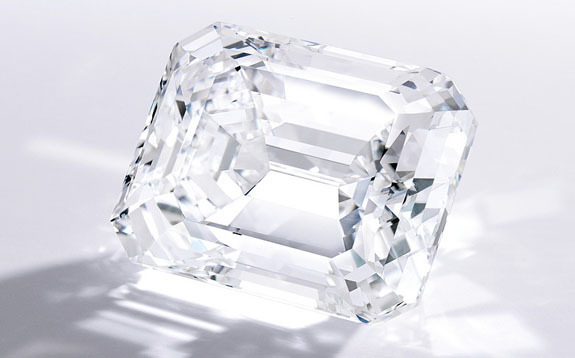 The emerald–cut diamond’s per-carat price of $220,558 is a bit lower than the per-carat achievements of two similar behemoths sold in 2013: The 101.73-carat Winston Legacy fetched a record $262,830 per carat, and the 118.28-carat Spectacular Oval Diamond rated narrowly behind at $258,708 per carat. Still, the $22.1 million selling price of yesterday’s show-stealer was impressive. The winning bid was submitted via telephone, and both the buyer and seller chose to remain anonymous. The bidding process took a mere three minutes. The previous owner sacrificed exactly one-half of the original 200-carat rough diamond to yield the 100.20-carat flawless gem. The cutting and polishing process took more than one year to complete. 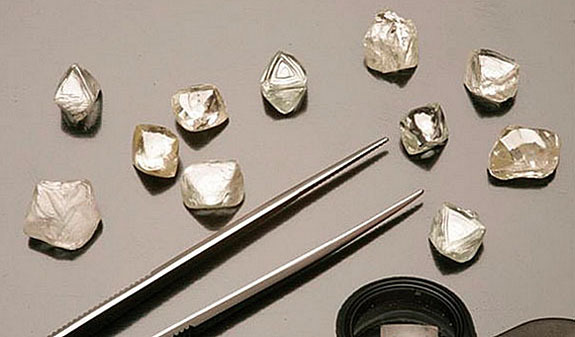 The rough diamond was mined by De Beers in South Africa within the past 10 years, according to Sotheby’s. 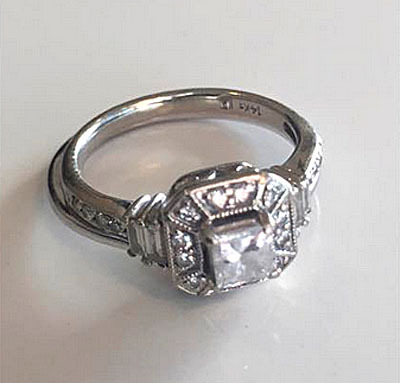 The diamond is set in a simple platinum ring, size 6 1/2. Before being put up for bid, the diamond starred in a multi-city tour, which included stops in Dubai, Los Angeles, Hong Kong, London and Doha. 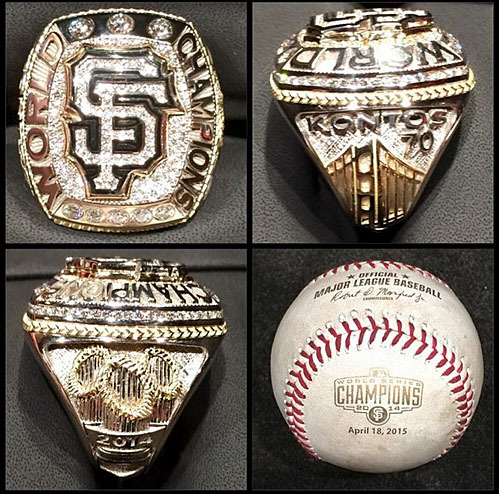 The San Francisco Giants received their giant-sized, diamond-encrusted championship rings on Saturday night at a festive pre-game ceremony commemorating their 2014 World Series victory over the Kansas City Royals. It was the team's third championship in five years. The celebration offered tradition with a twist — with four skydivers parachuting into AT&T Park to deliver the first rings to executive vice president of baseball operations Brian Sabean and manager Bruce Bochy. Giants announcer Duane Kuiper, an emcee for the ceremony, spoke about the significance of the championship rings. "Baseball has many, many traditions. Many are good. Some are great. But this ring ceremony may be the very best of them all. It's the one thing every professional athlete wants — a championship ring. Something they can hold on to, and something they can show off,” he said. The striking rings were designed and created by Tiffany & Co. to honor the 2014 World Series winners, the 2012 and 2010 championship teams, and the five titles won by the franchise while in New York. "We are thrilled to celebrate with the City of San Francisco and the Giants on another championship season," said Victoria Reynolds, group director of business sales for Tiffany & Co. “We are honored to have created the last three championship rings, which pay tribute to the Giants' dedication and performance on and off the field." 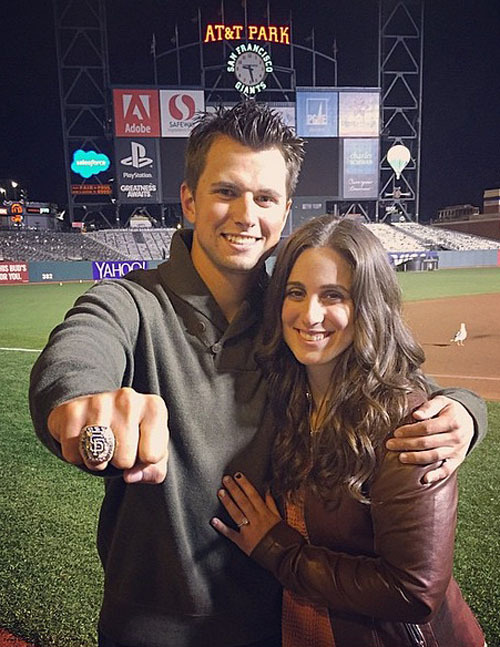 Second baseman Joe Panik proudly shared a photo in which he and his fiancée, Brittany Pinto, posed with his 2014 World Series bling. He captioned the photo, "What a special day! So proud to be a Giant!" "It was a big day today with the guys getting their rings," noted Giants manager Bruce Bochy. “They all loved them, too. They're beautiful rings, it's just a great night. It was good to see these guys smiling, and it reminded them that they are the World Champions." 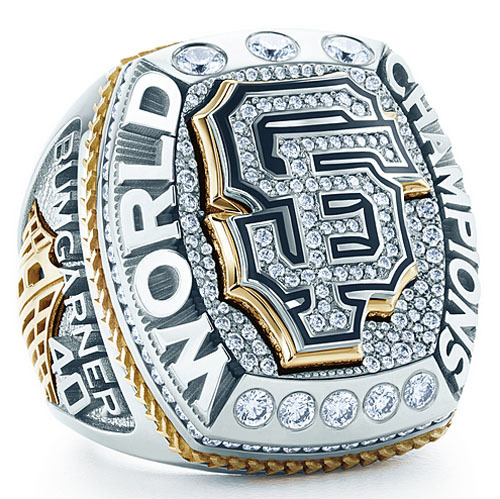 The team announced that a personalized World Series ring would be raffled off to benefit the Giants Community Fund. Raffle tickets and information are available online at sfgiants.com/ringraffle. Tickets are available until June 21. The winner will be announced on June 23. Welcome to Music Friday when we bring you great songs with jewelry, gemstones or precious metals in the lyrics or title. Today we have folk-rock legend Gordon Lightfoot singing “14 Karat Gold,” a song that uses a precious metal metaphor to convey how much he cares about the woman in his life. “14 Karat Gold” is the first track on Lightfoot’s 15th original album, titled Shadows. Prior to its 1982 release, the Canadian singer/songwriter provided radio stations with an interview album that offered his commentary on each of the tracks. 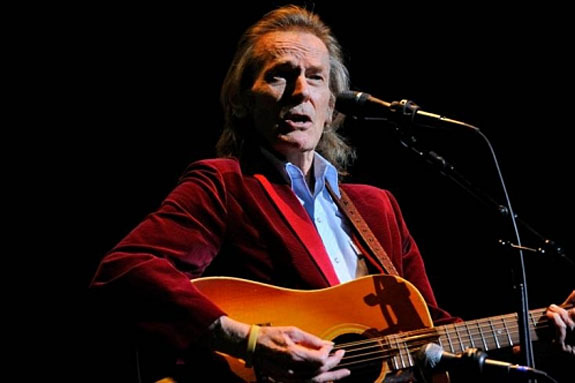 Often referred to as Canada’s greatest songwriter, Lightfoot's music career has spanned more than five decades. The 76-year-old has produced more than 200 recordings, including the chart topping “If You Could Read My Mind" (1970), "Sundown" (1974), "Carefree Highway" (1974), "Rainy Day People" (1975) and "The Wreck of the Edmund Fitzgerald" (1976). He has written songs for prominent artists, such as Bob Dylan, Dan Fogelberg, Jimmy Buffett and Jim Croce. Written and performed by Gordon Lightfoot. She's 14 karat gold. Sold. A super-rare 30.80-carat purple diamond with “exquisite gemological characteristics” was salvaged at a diamond tailings plant in Kimberley, South Africa. Tailings are the residue of the diamond-bearing ore that was processed during the original mining operation. Oftentimes, the tailings will contain viable gems and this is why Batla Minerals’ Superkolong recovery plant has been set up near DeBeers’ famous Kimberley Mine. The tailings plant recovers 15,000 carats of mostly lower-quality diamonds each month. The Kimberley Purple is currently on display in Antwerp and will be tendered later this month. Due to their rarity, purple diamonds demand the highest premiums and can yield more than $1 million per carat. 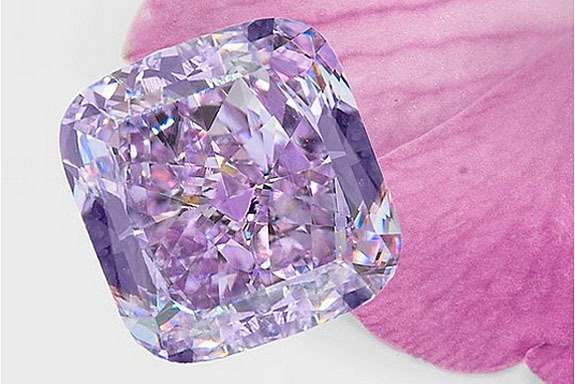 Back in September of 2014, we reported on the “Purple Orchid” diamond, a 3.37-carat fancy intense pinkish-purple diamond that was valued at $4 million, or about $1.18 million per carat. Israeli diamond company Leibish & Co. introduced the Purple Orchid to the world during the 2014 September Hong Kong Jewellery & Gem Fair. We pointed out at the time that what makes purple diamonds purple is still a scientific mystery. It’s been established that a yellow diamond gets its dazzling color from minute traces of nitrogen in the diamond’s chemical composition and a blue diamond gets its color from boron. When it comes to purple, scientists suspect hydrogen as the stray element, but they’re not so sure. Purple diamonds can be found in only three locations worldwide — South Africa, Russia and Brazil. While Russia’s purple diamonds have overtones of blue and Brazil’s purple diamonds tend to have a hint of orange, the purples and intense pinkish purples from South Africa display the absolute best brilliance and purple sparkle, according to Leibish. This fact bodes well for the Kimberley Purple, a South African stone. We can’t wait to see what cut is in store for this fabulous find. Images: Kimberley Purple via nationaljeweler.com (uncredited); Purple Orchid courtesy of Leibish & Co.
A moonlighting Alabama police officer toiled through the night and into the early morning hours — using his plumbing and social media skills — to reunite a diamond engagement ring with its distraught owner. Leslie Shannon was washing her hands at Al's Deli and Grill in Birmingham when her fun ladies' night out turned into a house of horrors. The 32-year-old newlywed told AL.com that she usually places her bridal jewelry in her mouth when she uses the sink so she won't forget to put the set back on. But this time the rings fell out of her mouth and spun right down the drain. "It's a sickening feeling," Shannon said. "I immediately started ripping apart the sink and the pipes. If you can only imagine losing your wedding ring — you can do anything with the adrenalin going through your body." Before long, the women’s bathroom and the adjoining men’s bathroom were filled with a frenzy of friends and restaurant patrons looking for ways to extricate the precious keepsake from the plumbing system. They reluctantly gave up after 2½ hours, with Shannon accepting the fate of her cherished ring. It was most likely lost to the Jefferson County sewer system. 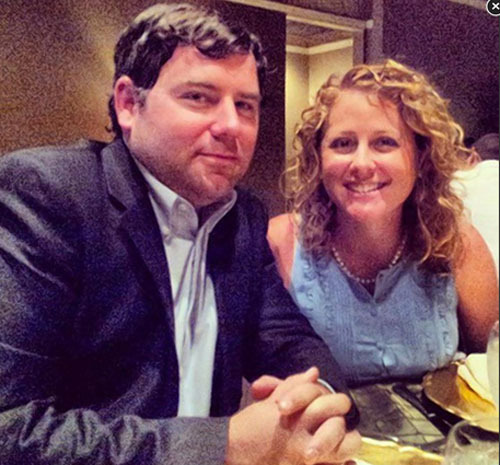 What the devastated Shannon didn’t know was that Birmingham police officer Travis Hendrix, who moonlights at Al's, had witnessed the wild bathroom activity and wasn't going to give up without a fight. "I didn't want it to end there for her,'' Hendrix told the New York Daily News. "I knew deep down she is a very kindhearted, very sweet person. It's just something I had to do." Hendrix, the restaurant’s manager and another friend pooled their talents, working through the night and into the early morning hours to fish the ring from the bathroom pipes. It was a small miracle, Hendrix told Al.com, when the trio heard the ring jingling somewhere deep down in the pipes. After the ring was saved, there was one more big task at hand. Hendrix didn’t know Shannon’s full name or how to contact her. Hendrix remembered that during the restroom commotion the woman’s friends had called her “Leslie.” He also knew that her group paid its tab that night with a credit card. The officer located a credit card receipt of the woman he believed to be Shannon’s friend, and then trolled various social media to get more info. "I went through LinkedIn, Facebook and Instagram,'' Hendrix said. "I was looking up all types of crazy things." "I made 20 to 30 calls from 4 a.m. until 5:30 a.m.,'' Hendrix said. "I ended up finding the friend she was with on Instagram." A few hours later, he was able to get a message to Shannon via her Instagram-connected friend. When Shannon heard that her ring had been found she immediately started crying. "It was tears of joy,” she said. “I couldn't believe it." 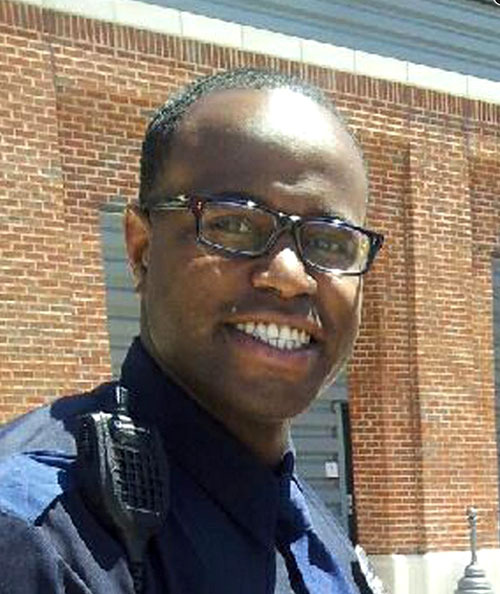 “In the past year when it seems all you hear and see on TV are negative things about police officers,'' Shannon's husband, Ken, wrote to AL.com, "I had a Birmingham police officer go above and beyond his call of duty." "I'm just glad she's OK now,'' Hendrix said. "I knew how much it meant to her. If it was me, I'd want her to do the same thing. I was just doing my job." 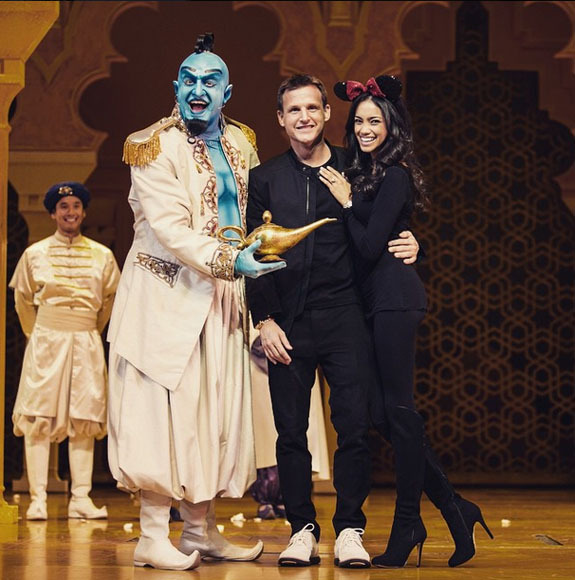 MTV reality star Rob Dyrdek surprised his girlfriend Bryiana Noelle Flores with a gorgeous diamond ring and a fantastical “Aladdin” marriage proposal during a live show at Disneyland, the happiest place on Earth. The engagement ring appears to be a colorless 10-carat-plus round solitaire diamond in a simple six-prong setting. The clever Dyrdek excused himself to go to the restroom, leaving Flores frustrated that he was about to miss the most exciting part of the show. 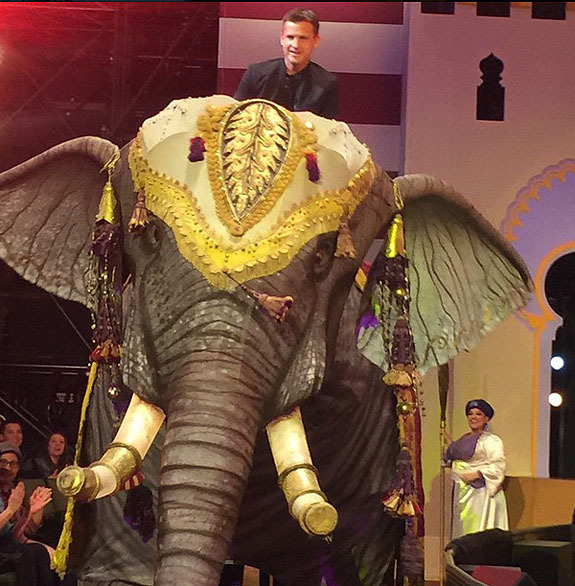 But a few minutes later, as a parade of exotic animals rolled through the audience, Flores was floored to see Dyrdek riding atop an elaborately adorned elephant in place of Prince Ali. The wacky reality show host gave a shout out to the Genie for granting his wishes without hesitation. His first wish was to be part of the show. His second wish was for his girlfriend to come on stage. With Flores now at center stage and Dyrdek dismounted from the elephant, the romantic Fantasy Factory star got down on bended knee and asked, “Bryiana Noelle Flores will you marry me?" Flores said “Yes” to the delight of the Disney audience. Soon after, the couple soon jetted off to the Caribbean to celebrate. No wedding date has been announced. 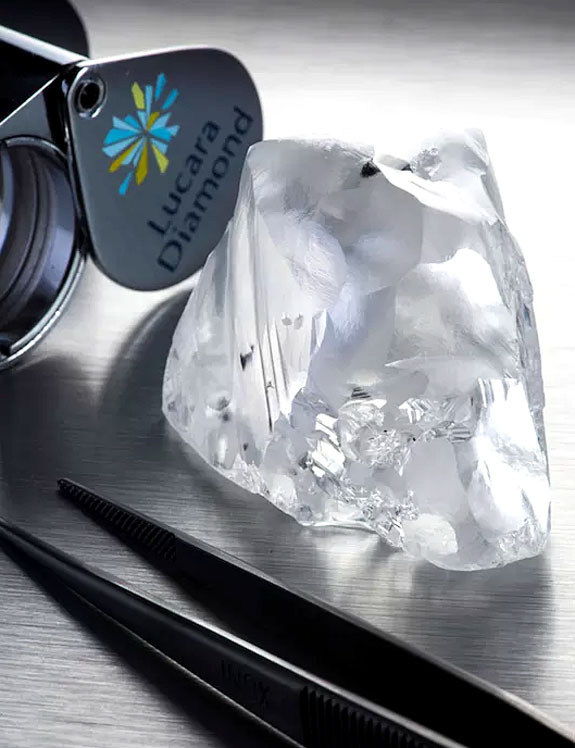 Lucara Diamond Corp. unveiled last week a 341.9-carat gem-quality rough diamond recovered from its prolific Karowe Mine in Botswana — a mine that owns an impressive track record for producing the world’s largest fine diamonds. 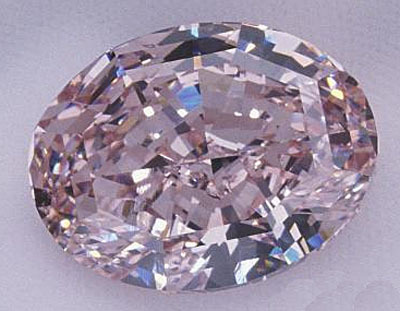 The company described the specimen as a Type IIa diamond with exceptional color and clarity. It will be sold along with two other 100-plus-carat Karowe-sourced diamonds. 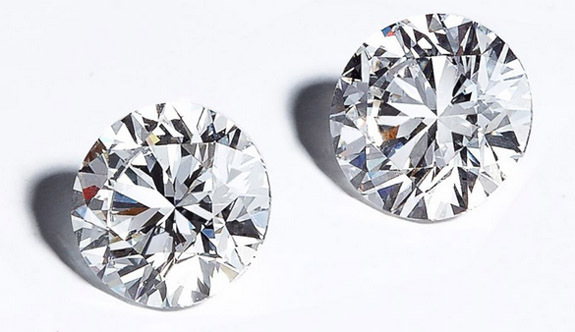 Type IIa diamonds are considered the purest of all diamonds because they are composed solely of carbon with virtually no trace elements in the crystal lattice. A rough diamond will typically lose half its weight during the painstaking cutting-and-polishing process. Although it’s still unclear what the final shape and weight of the 341.9-carat rough will be, we’re confident the results will be museum-quality. “The recovery of this magnificent stone once again confirms the quality of diamonds contained within the Karowe resource,” Lucara president and CEO William Lamb said in a statement. Last spring, we reported on 13 huge diamonds produced by the Karowe Mine. All were larger than 100 carats and two were larger than 200 carats. Eight of the 13 were classified as gem quality. Gems of these sizes are extremely rare in nature, but new techniques employed by mining companies have improved recoveries and reduced breakage of exceptionally large stones. Lucara announced the rollout of X-ray transmission (XRT) imaging technology that will allow the company to increase the effectiveness of its diamond recovery. 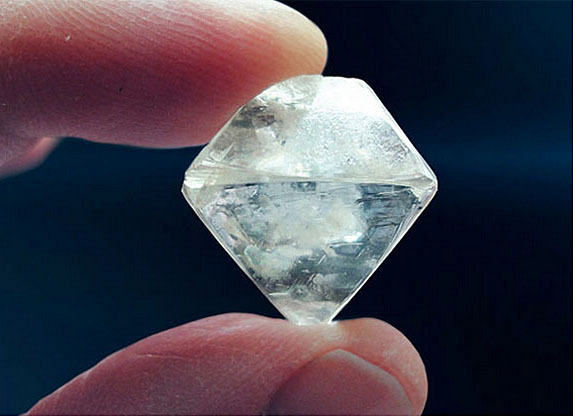 Because of a diamond’s unique properties, the machines can be calibrated to extract valuable material using X-ray luminescence, atomic density and transparency. New recovery and XRT stations were scheduled to be integrated into Karowe's main treatment plant by the end of this month.